Enjoy a complete media experience with the new feature-rich Iomega® ScreenPlay™ Director HD Media Player. 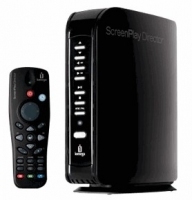 With full 1080p high definition (24 fps) and up to 2TB of space to save your files, the ScreenPlay Director adds exceptional features like direct access to online media and network connections. This high-definition multimedia player connects easily to your home network to store & access your videos, music and photo collections. Easily browse your network to select stored videos and view on your home theatre or access online content with the convenient remote. Compatible with the latest media formats such as H.264, WMV, MKV, MP3, AC3 (Dolby® Digital Encoding), WAV, WMA, MPEG-1, MPEG-2 (AVI/VOB), MPEG-4 (AVI/XViD), DivX® and JPEG. It supports the Iomega USB WIFI Adapter for wireless access (adapter sold separately). Includes Iomega Protection Suite software. The ScreenPlay Director is powered by an Energy Star® qualified adapter for a better environment. Features - Enjoy high definition movies on your home theatre; store and access media files on your home network; - Access online content on internet sites such as YouTube, Flickr, Internet radio, RSS feeds, or podcasts; - WIFI ready for wireless access using Iomega 802.11n Wireless Adapter (adapter sold separately); - DivX Home Theatre Certified; - Includes Iomega Protection Suite anti-virus and backup software solutions; - Convenient Browse your home network to select stored media files to enjoy on your HDTV with a touch of the remote; directly access online media sites; connect to your WIFI network (adapter required); - Versatile Supports many CODECs and file types including H.264so you can enjoy your entire media collection; 3 USB ports for multiple connections to external storage, camera, or flash drives;Listen to music while you watch a photo slide show; - Large capacity Save up to 1500 hours of video, 4,000,000 photos,or 18,500 hours of music; - Stylish Compact enclosure to complement your home entertainment environment.